As the mountains sit in the rising shadow of winter – and without much snow – I’m inside and warm and dreaming about summer. While going back through some old files, especially those of Colorado wildflowers, I wanted to share a few of my favorite locations in no particular order. I know there are so many more places hidden in the Rockies that provide beautiful meadows of color, and I hope to visit some of these in the coming years, but for now here are a few of my go-to places. Butler Gulch – Since I call Winter Park my summer home, Butler Gulch is easily accessible. From Winter Park and Grand County, it is just over Berthoud Pass and near the cluster of buildings called Berthoud Falls. A short drive up a dirt road to a parking area, and you’ll be on your way. I usually make this hike in the dark before sunrise. I’ve found that it takes about 45 minutes to cover the 2.5 miles or so to the gulch where the wildflowers bloom. The only difficult part, besides the steep grade over the last quarter mile, is a crossing that is usually covered with a snow-melt stream. Often in late July, there is no way to avoid getting wet unless you wear waders. So I just wear old shoes and face the cold water. Of course, this makes the next few hours mind-numbingly cold on my feet some mornings when the temperature is around freezing, but sunrises and meadows filled with Columbine, daisies, paintbrush, and many other wildflowers of this area can make the discomfort worth it. And with all the mornings I’ve spent shooting up in Butler Gulch, I’ve never seen another person until I’m on the way back to the parking lot. 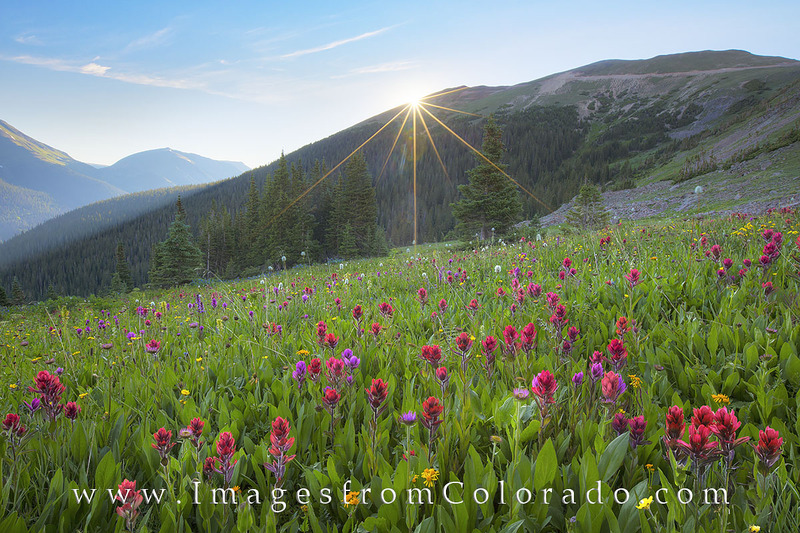 Rosy Paintbrush greet the first light of day in a meadow atop Butler Gulch. This trail is just over Berthoud Pass from Winter Park, Colorado. The wildflowers in July and August can often be stunning. It was an early morning, but I know I can be at the trailhead in just under 30 minutes from my place in Winter Park. Then it is a 45 minute hike to this point. With dew on the ground and temperatures in the upper 30s, my feet and hands were freezing. Still, for a sunrise like this, the discomfort fades quicky. Rocky Mountain National Park – I know this area – and Trail Ridge Road -is not known as a hotbed of summer wildflowers, but in July along the slopes of above tree line, you can often find Old Man of the Mountain. No…. not guys like me… but beautiful golden, rugged sunflowers. If you time it right, the slopes can be fairly saturated with these tough little yellow blooms, and with a sunset to the west, the high mountain landscape can be quite amazing. 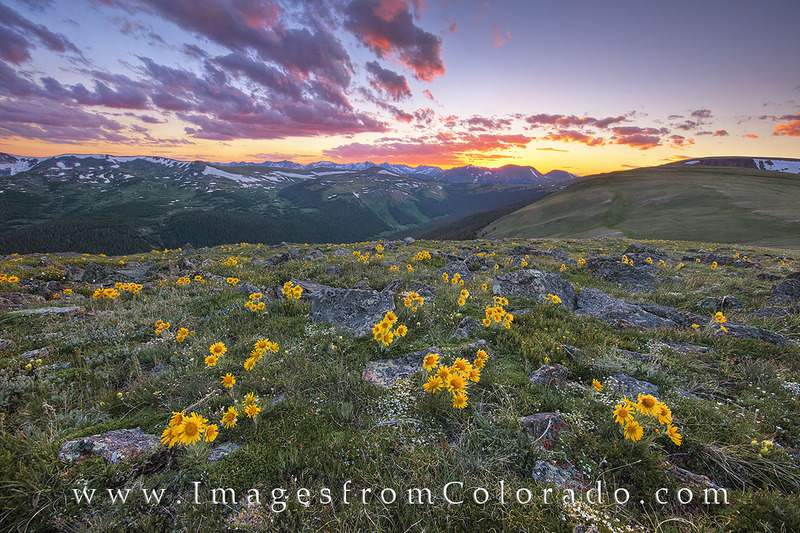 Colorado wildflowers bloom above treeline in Rocky Mountain National Park. Just off Trail Ridge Road, these golden flowers, called Old Man of the Mountain, can usually be seen in July on the rocky slopes of this high mountain drive. Yankee Boy Basin – About eight miles out of Ouray, in the shadow of Mount Sneffels (or the Sneffelophagus as my hiking buddy calls this 14er), summer brings a palette of color. 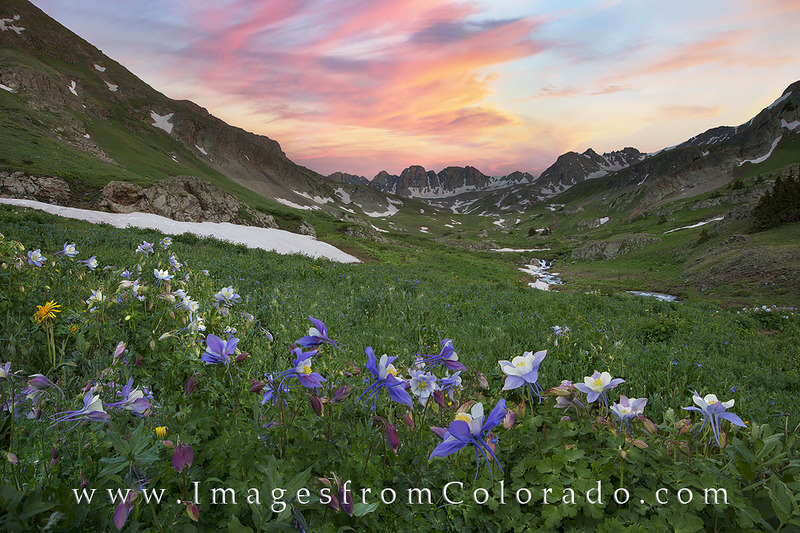 Blooms of lupine, columbine, larkspur, elephant tusks, and many more fill in the gentle slopes. With rising mountains in all directions, the backdrop and landscape can be captivating. I’ve visited this location several times. Sometimes the wildflowers are amazing; sometimes they are not so much. This past summer, the blooms showed a lot of potential, but a July summer hail storm sadly ended hopes of a pretty bloom. You just never know. The road to Yankee Boy Basin from Ouray is rough and youâd probably want a 4WD car for the bumps, though Iâve seen some 2WD cars attempt it, but the trek is worth it in July and August. Colorado wildflowers are on full display this time of year in the San Juan Mountains and come in all colors and varieties. This image was taken on a cool summer evening, and the view was amazing. American Basin – Twenty or so miles outside of Lake City, at the beginning of the “Alpine Loop scenic byway – along the Lake San Cristibol Road (CO 30) – this beautiful area sits in the shadow of the beautiful San Juan Mountains. A small stream flows down through this valley, and often the columbine paint the gentle slopes in various shades of blue. Use caution driving – the last mile of this dirt road is pretty horrid. You can also follow the road up and over Cinnamon Pass and down into Silverton. I’ve done that once - won’t do it again! Columbine and other Colorado wildflowers enjoy the cool evening at American Basin, a short 16 mile drive down a bumpy dirt road near Lake City. I had camped at the nearby Silver Creek Trailhead with plans to hike Redcloud and Sunshine the next morning. However, I wanted to photograph these beautiful wildflowers, as well. I had almost given up on the clouds lighting up, but thankfully for a few brief moments, the sky turned pastel shades of pink, orange, and blue. Blue Lakes Trail – Just outside of Ridgway, Colorado, the Blue Lakes Trailhead resides in the spectacular Mount Sneffels Wilderness area. This path offers stunning views of Mt. Sneffels and the Dallas Creek drainage area. If you make it to the second lake, you’ll cover nearly 9 miles round trip, and the hike from the first lake to the second lake is quite a grunt. For me, the most stunning view was from near the ridge above the first lake. After sweating a steep trek up, then crossing a small stream, I followed a path at the top of a steep slope absolutely covered with wildflowers – daisies, columbine, paintbrush, and more. My buddy and I paused here and enjoyed the view for quite some time. It is a scene I won’t forget anytime soon. And I hope I can bring my own girls here when they are older to instill an appreciation for the beauty the San Juans can offer. 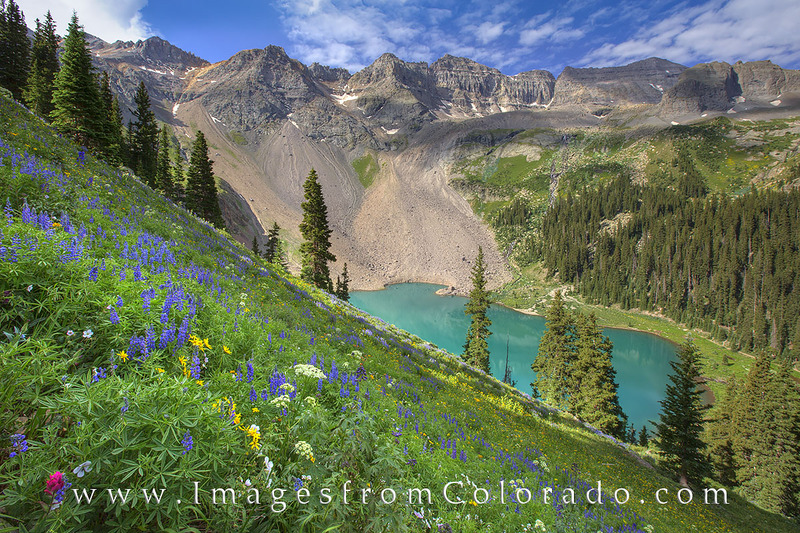 The Blue Lakes hike near Ridgway offers one of Coloradoâs best wildflower treks. In July and August, blooms of all colors and sizes can be enjoyed. With a little grunt work, you can hike above Lower Blue Lake, seen here, for stunning views of both a wildflower covered slope and distant peaks of the San Juan Mountains. Going further up on the trail, youâll reach the alpine Upper Blue Lake. Continue on after that and you have access to Mt. Sneffels, one of Coloradoâs 14ers. Colorado offers so many places for beautiful wildflowers. Sometimes you have to trek to get there. Other times, the flowers are just outside your car window. The colors, shapes, and diversity, along with a background of rugged mountains keeps me dreaming about summers in the mountains. Until then, happy 2018, everyone! 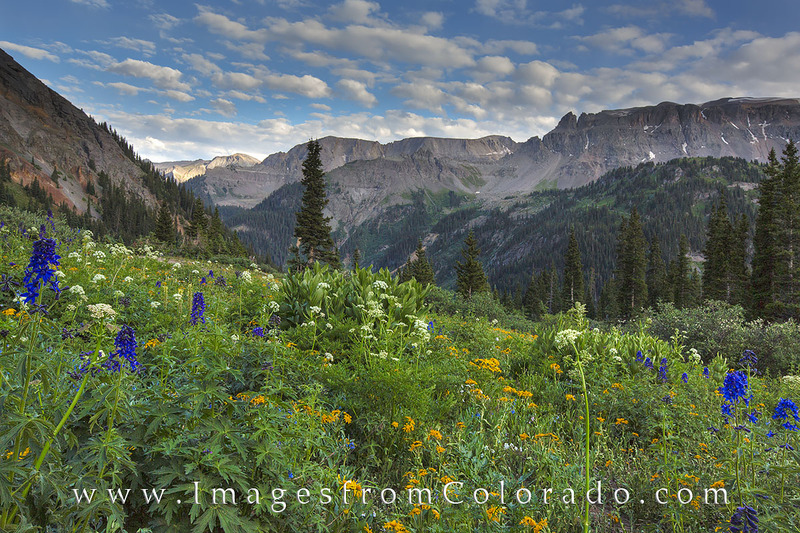 All images in these Colorado galleries are copyrighted by © Rob Greebon Photography. No files or written content found within this site may be used or reproduced in any form without the expressed consent of Rob Greebon.